Thank you so much for playing at their wedding and travelling all the way to Staffordshire. All the guests commented on your amazing playing. You played for everyone taste in music, classical, musicals, to pop and even Disney for the children. You played at my eldest daughter Lucy’s wedding seven years ago and Alicia was eager that you played at hers. You were as wonderful as we remembered. I must write to thank you wholeheartedly for playing at our wedding last week. You were fantastic and the selection of repertoire you helped us with absolutely made our wedding day. Everyone said how wonderful you played even in the cold! It was more beautiful than I envisioned and it took all my strength to hold back the tears as your played as I walked up the aisle! I only wish I had some more time to sit and listen to you play! Kelly and I just wanted to say Thank you so much for playing yesterday. 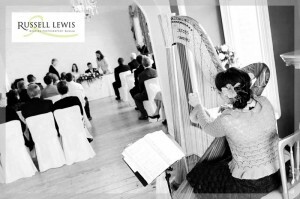 It was wonderful, the harp really seemed to complement the wedding ceremony. 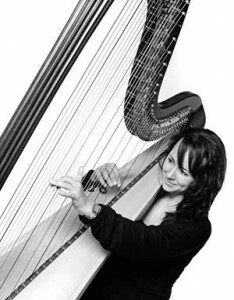 I’ve never heard modern music on the harp and thought you done a fantastic job, it sounded beautiful. I wanted to say hugeeeee thank you! You made our day perfect! You play sooo beautiful. You were amazing! You have completed our day. Many guests complemented about your beautiful and mesmerising music. I would like to say a huge thank you for playing so beautifully at my daughter Emily and Huw’s wedding on Thursday. It was a truly magical day and your harp music made it extra special. So many of our guests commented on how much they enjoyed it and you were thanked wholeheartedly during the speeches! Once again, thank you, you are lovely and your playing exquisite. Thank you so much for creating such a beautiful atmosphere at our wedding. You were professional and helpful beyond words, even going so far as calming me down as I stood nervous at the alter! You were a delight to work with and someone we will instantly recommend in the future should the opportunity arise. Well! What can I say!!!? Your playing yesterday was absolutely wonderful! It was all we had imagined and you are such a lovely person! I feel as if (probably because I emailed you so often!!!) I have known you for ages! and it was such wonderful part of our day! From the moment I walked down the steps and heard you play (I’m getting teary now just thinking of it) it was magical! You played all that we had asked and we loved hearing the different songs and pieces throughought the service and afterwards.Just wanted to say thankyou thankyou thankyou! We both loved it and lots of people commented on how lovely it all sounded. We wanted to thank you very much for playing for us on our wedding day. ..You did the most wonderful job and helped make the day truly special for us. Everyone was in awe of the beautiful music that you played. Myself and Danny are just back from honeymoon and we wanted to say thank you for playing so beautifully for our wedding at Margam Park Orangery 2 weeks ago. We have had so many people saying how lovely you played and we completely agree. So thank you again. What can we say, we are so, so grateful for everything you did, it exceeded all our expectations and made our day so perfect, we cannot thank you enough. We can even say we heard and recognised most of the songs on our wish list, which was amazing…..once again thank you so much. I just wanted to drop you a quick email to say “a massive thank you” for playing at our wedding on the above date. You were amazing, we loved you, everyone loved you. From start to finish you were just so professional, your range of music is overwhelming. So many people commented on you, everyone thought you were great. I’m looking forward to getting the DVD and hearing you again. Can I also say that your pink shoes went down a treat, I love shoes and for you to match them to our colour scheme I thought that was very sweet of you. Thanks again Amanda, I will definitely recommend you time and time again. Thank you…for providing such a moving and varied array of music. My wife and I were particularly struck by your skill and the strings provided the perfect and subtle background mood that seemed to calm everyone present. 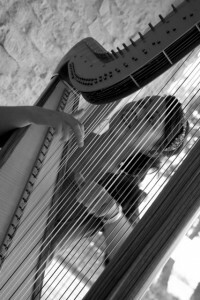 Memories of your beautiful Harp music filling the castle ruins will stay with us. Thanks again for coming so far and bringing some extra magic to Lisa and Scotts wedding day. Thank you for playing so beautifully at our wedding in Bath last Thursday. Your suggestions and selection were spot on and were the perfect compliment to the setting and ceremony. We had a wonderful day, not least at the ceremony and received many glowing comments with respect to the harpist and her repertoire! have a variety of styles! for us and the guests. With many years of experience, Amanda can help you choose the right music to enhance the atmosphere of your special day. It is important for the couple to spend some time picking the music- it will be the soundtrack to their memories! ~ To play for the breakfast from the line-up to the coffee / speeches. (Please state if you are having speeches before hand). Parties of 40+ people may need amplification- please state if this is the case. Costs may vary depending on date, number of guests and distance.